Indiana Jones series is about the heroic fictional archeologist Indiana Jones’s adventures. 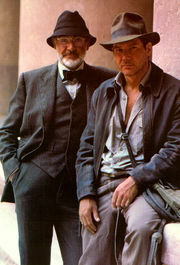 Potrayed by Harrison Ford, Professor Indy is noted for his trademark bullwhip, his fedora hat, and his extreme fear of snakes. His dad, Dr Henry Jones Sr (played by Sean Connery) was also a professor. His father often calls him Junior. He has accompanied his father on his travels around Europe where he learns to speak,read and write in various languages includes French,German,Italian,Spanish,Russia,Greek,Chinese, apart form English. There was also the television series, The Young Indiana Jones Chronicles, aired from 1992 to 1996, with the 17-year-old Indy played by Sean Patrick Flanery, 93-year-old Indy by George Hall, and 10-year-old Indy by Corey Carrier. This inspired a number of made-for-TV and made-for-video movies featuring Flanery as young Indy. One of the last Young Indiana Jones TV movies featured a cameo appearance by Harrison Ford, reprising the role of Indy as a man in his 50s. The show ran for 44 episodes, with each pairing of episodes forming a feature-length TV film. The stories spanned from Indy’s childhood travels with his father (who was on, what seemed, one continuous Medieval studies lecture tour) to the solo journeys of his youth and even into World War I. Every episode began with a 93-year-old Indy, a grey-haired professor, talking about one of his old childhood adventures. This entry was posted on Monday, January 1st, 2007 at 5:39 pm	and is filed under Movie Trailer. You can leave a response, or trackback from your own site.